Shubham Goel wants to channel his experience in virtual reality into his gubernatorial race in California. Goel, 22, the youngest gubernatorial candidate, may be making a quixotic effort, but he is for the highest office. Goel he is one of many Indians standing for election in the state primaries tomorrow. Some members of the community are voting along, prominent among them being the Sikhs. 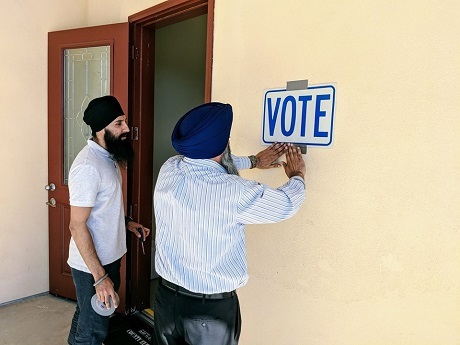 “Sikhs are working closely with Sacramento County election officials to ensure that we take advantage of the opportunity created by the California Voters Choice Act,” said Amar Shergill, founder of American Sikh Public Affairs Association, based in Sacramento. ASPAA has set up a voting center at Gurdwara Dashmesh Darbar Sahib in Sacramento to drive the effort. “We have already seen a large increase in new voters and of those who might not have voted in a primary election. It is important for all Americans to vote and we are doing our part,” said Shergill, a Democrat. 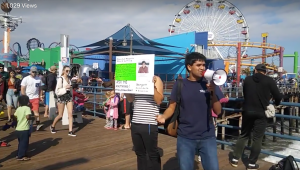 Shubham Goel campaigning in Santa Monica, Calif.
Goel takes on a formidable set of competitors, including the favorite, Northern California-based Lt. Governor. Gavin Newsom, a Democrat; southern California-based former Los Angeles Mayor Antonio Villaraigosa, also a Democrat; and two Republicans businessmen John Cox and Assemblyman Travis Allen. Cox is gaining some traction in the race, thanks to an endorsement from President Trump. Only the top two candidates with the maximum votes, from whichever party, will head to the general election on November 6. Dilip Bhutani, co-chairman of the Indian American Republicans of California, told indica his group was voting for Cox because he plans to make legislative districts small enough that anyone can run and because Cox has put together an economic plan – to repeal gas tax increase and that will make California affordable for middle-class families. Bhutani said, “Heraclitus, the Greek philosopher, said “Change is the only constant in life,” and I think California needs a change.” He also cited the case of Ronald Reagan, who declined a third term as governor. “Indians tends to be Democratic voters even with the issues of taxes it would be very surprising if there is a shift,” Karthick Ramakrishnan, associate dean of the UC Riverside School of Public Policy, and professor of public policy and political science told indica. Shubham also believes all office holders in California should have a transparent digital profile on their websites, including their financial interactions. On the education system, which he has traversed but recently, he says virtual reality should be introduced at schools to rapidly enhance learning and development. He also believes the governor should no longer have the power to appoint the 18 regents to the nine UC campuses. Instead, he believes, students of the universities should pick them, so as to ensure they are accountable, transparent and representative of the student body and the campuses they preside over. Besides Goel, there are some more traditional candidates. Such as Assemblymember Ash Kalra, a Democrat, and incumbent, who is running unopposed from California Assembly District 27. Congressman Ro Khanna, from Congressional District 17, faces Republican Ron Cohen and two other Democrats, Khanh Tran and Stephen Forbes. Khanna seems solidly entrenched, though, even postponing a scheduled debate with Cohen, the Republican candidate, on June 3, citing a family issue. Cohen told indica he felt the Democratic party is going way far left and it is going into socialism. “If I would vote I would vote with Paul Rayan. Khanna generally votes with Nancy Pelosi, who is a completely out of her mind socialist,” he said. Cohen also felt that Fremont becoming a sanctuary city is unconstitutional since immigration is a federal issue unless the federal government is abusing it for some reason. “But it is not, and the state and local government have no place [here]. “I support legal immigrants,” Cohen said. Another incumbent is Congressman Ami Bera, a Democrat from California Congressional District 7, who faces two Republicans, Yona Barash and Andrew Grant. Viswanathan wants to make public colleges and universities free for all Californians. Building more housing and investing in infrastructure across the state. And has the endorsement from major California publication, Mercury News and East Bay Times and San Diego City Beat. However, his biggest contender is Fiona Ma another Democratic. Viswanathan has some experience in the upper levels of government, having served as a special adviser in the Office of Governor Jerry Brown from 2017 to 2018 and as a policy adviser to former Secretary of State Hillary Clinton during her 2016 presidential campaign. Fighting for the US Senate seat is 73-year-old Rash B Ghosh, a professor of environmental chemistry based in Oakland. He is running as an independent, with the aim of fighting corruption and systemic racism. Arun K Bhumitra, a Republican based in Torrance, is also running for US Senate.